This is the ultimate guide to the different types of fans for your home or workplace. There are many different types of fans that will suit quite different situations. 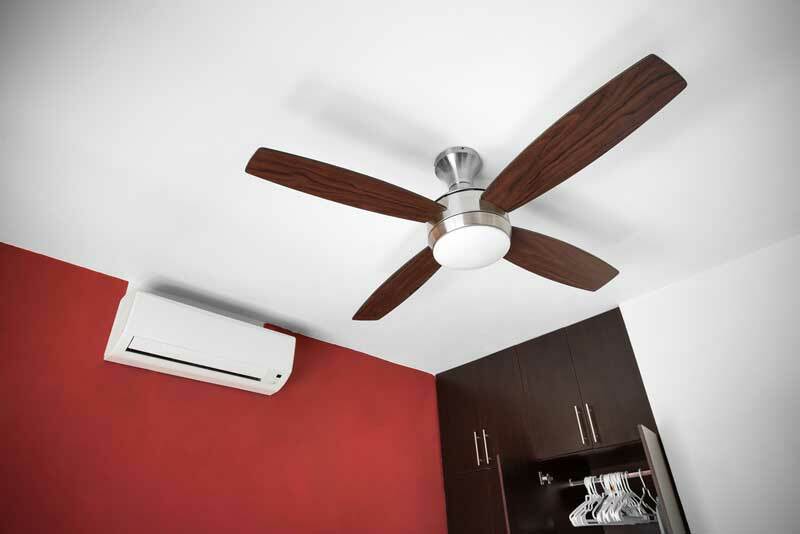 We run through each fan and give you an overview of what the fan is suited for, its features, along with its airflow output and how it may fit with your decor. There are a number of different types of fans for your home or workplace, and this guide will give you a break down of each. Table fans are one of the smallest types of fans. These fans are generally quite small and portable which makes them easy to move from one place to another. At some point table fans blur the lines with clip-on fans, however, table fans generally are bigger, more and less versatile than clip-ons. The vast majority of the time you will find the design of a table fan to be based on a ‘dish’ shape much like a pedestal fan. This is obviously because of the fan blades and that casing that protects your fingers (and other things) from the blades. Many table fans are simple in their design and consist effectively of the fan and some form of stand to keep them sitting upright on a desk. 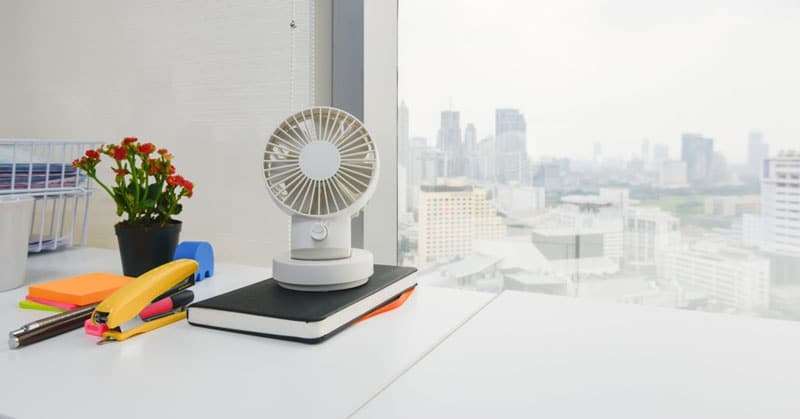 Desk fans also come in the shape and form of what is effectively a mini tower fan which are upright and have their blades firmly integrated inside the unit, most of the time so you can’t see them. If you don’t like the traditional ‘round’ look of the standard desk fans then a tower desk fan might suit a little better. Often they are a bit more aesthetically pleasing and will likely slot more seamlessly into your surroundings. Given their shape too, it makes them a better choice if you are somewhat short or looking to preserve precious desk space. Although the article is about the larger versions, you can get an idea of the pros and cons of a pedestal type fan vs a tower type desk fan here. Finally, if you want to add a whole lot of character to your desk or tabletop there are all sorts of decorative and creative type desktop fans available. Probably best to take a look for yourself what is available as everyone’s tastes will differ but you can get desktop fans in the form of pineapples, geckos, fish, flowers to boots. There is certainly a lot on offer for that unique touch. What kind of Airflow does a Table Fan have? 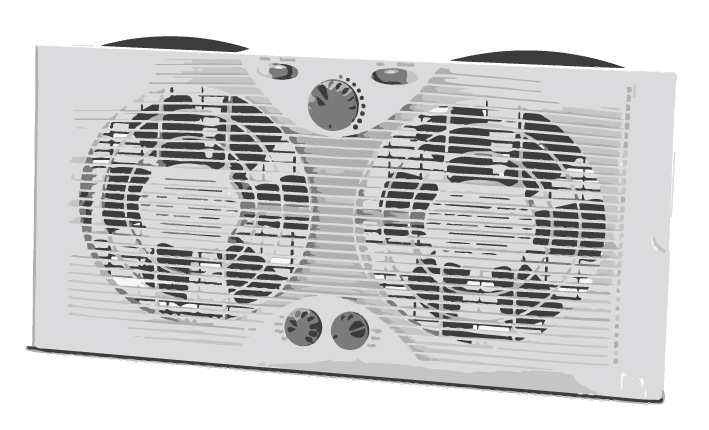 As far as desktop fans airflow goes there is quite a range of CFM output which will give you a wide range of choice because the table fans can come in so many different sizes. Some of the small, personal desktop fans can come with around 25CFM while some of the larger fans, such as the Dyson AM06, according to the sweethome.com averages an output of around 569 CFM. This should give you an general range of airflow output you might get. How Many Speeds do Table Fans have? I’m not sure about your office, but ours fluctuates in temperature day to day given we have no control over the controls. It is a good reason to have a lot of options when it comes to your desk fan. So what can you expect in terms of table fan speeds? Well, there is generally a range of between 1-10 speeds when it comes to table fans. Some of the more basic and smaller fans may only have the 1 speed. For the most part, though it is pretty common for a desktop fan to have 2,3 and sometimes 4 speeds. Of course though, if you are using the office credit card, and price is not an issue, you could look at the high-end fans such as the Dyson AM06 which has 10 speeds. What Features do Desktop Fans have? For the most part table fans are pretty basic in terms of features that come with them. Generally, you might have a tilting option for more control over the direction of the fan. Some fans will have an oscillation option and there are fans with a small storage compartment for paper clips or other small bits of office stationery. BUT, if you wanted to throw a bit more money at a table fan (yes there is that name Dyson) you will be able to get a few more features. The top of the line Dyson Am06 comes with a few features other table fans do not have. For example, the Am06 has a sleep timer of which you can control when the fan might turn off automatically. Along with that, the Am06 comes with a remote control for extra ease of use. How do you clean a Table Fan? Because they are fairly simple in their construction cleaning a table fan is relatively easy. The only part of any difficulty is getting the front grill to come off. When you have the grill off, it is recommended by manufacturers to use a damp cloth to clean the fan. What size Table Fans can you get? 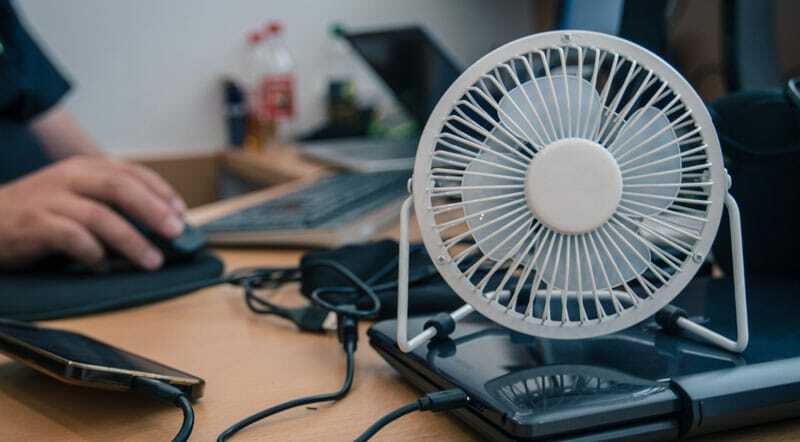 Being you probably don’t want to clutter your desk with a fan, desk fans are generally fairly small. Probably an average sized table fan is 12 inches. You can get smaller fans (usb) and also clip on fans. In around the 8-9 inch mark the line between table fans and clip on fans kind of blurs. For the most part, a traditional, nonclip on table fans tend to start in size from around 9 inches. The tower table fan models tend to be a bit taller given their design and can reach up to 17 inches high with some designs. What are the prices of Table Fans? Given the lack of features and size, you can pick up a table fan for as low as around $12. The more decorative and the more features you want in your fan the more the price will rise. If you want to splurge on a high end table fan, you can expect to pay around the $300 mark. Box fans are low to medium strength, no-frills fan which are suited for around the house or office. Box fans are less powerful than floor fans but more versatile. They are less bulky so are more portable and can be used in smaller spaces such as on a table in a workshop for example. If you have amazing decor in your home and are looking for a fan to complement or fit in with your decor stylistically, box fans are not likely for you. They are rather simple in design in that effectively that come in a rectangular, ‘box’ shape. There are a few different designs within the pretty narrow design parameters of how a box fan can look. Generally, overall they carry the same shape with various facades covering the fans. Box fans blur the line a little with floor fans in that you can use box fans on the floor like a floor fan, but generally, you won’t use a floor fan anywhere else. Box fans are a little more versatile in terms of their use. Some people use box fans as window fans in order to bring cold air in at night, saving on power and AC usage. BUT though they are capable of this, it is not what they were designed for. Window fans are specifically made for wet weather, however, box fans are not. Many have also been able to make a box fan filter and in fact, you can actually purchase box fan filters to help turn your box fan into an air purifier. Box fans are extremely cheap to run and according to Lasko box fans can run at as little as 2 cents per hour. Much like the features we get to below, and as you can probably see anyhow, box fans are very simplistic in their design. Most box fans will come with 2-3 speeds. When it comes to features, box fans are your no-frills version of fans. They are pretty much as simple as you get. Speed control is basically the only feature you will get on a box fan. You could throw in attachable feet as a feature which some fans have to add more stability to the units. Just to fill up the feature section a little more you could consider a carry handle a feature, though most fans will include this in the unit. For good measure, we will add a removable front grill to the features list for box fans. This helps with cleaning the fans or for any other reason you might need to get inside you fan. Check out our in-depth guide to find the best box fan. Because box fans are so simple in their design and construction they are fairly easy to clean. A number of fans will enable you to take the frame apart in order for you to easily get inside and clean the fan blade. Once done thoroughly dry the fan and ensure no water gets in the motor. There are many options when it comes to smaller fans. There are fans with alternative power sources (USB, solar, mobile phones) and even small mist fans. These fans are the least powerful but most versatile and portable. Given they work in close proximity to the user they can provide a reasonable cooling effect despite their minimal output. You will find a number of different style of mini fans which serve different purposes. There are clip on fans which serve to be mobile fans which can be used on strollers, camping, fishing, on your work desk in your car and anywhere else on the go that can take a clip. Handheld and portable ‘box’ style fans are some other small, portable choices. You can even get tiny solar powered mini fans. Much like their tabletop brethren you will find that USB clip-on fans tend to look much the same though there are a couple of different styles. Round & Square. You might get some unique designs but within narrow parameters, so generally what you will find is a round looking design with a clip. There are of course a couple of exceptions when it comes to design, such as a tower fan style and some that look more futuristic. Heck, you can even get a mini fan which plugs into your cellphone vis mini usb. Some clip on fans have the ability to both tilt and rotate enabling you to control exactly where the airflow is pointed, however, check the model you are looking at as not every fan has these abilities. There are also fans which come with a lanyard, fitting nicely around your neck for that easy portability when running or perhaps visiting warm and humid places. You can also get mini USB floor style fans. Obviously being so small you are not going to get a huge amount of airflow from these fans. Their advantage is that, because of the small size, you are able to put them much closer to you than other fans. So how much airflow will you get from one of these fans? Again, it will depend on your style of portable fan but this standard size clip-on fan is listed as producing 306 CFM. You may get slightly more or slightly less than that depending on your fan but that will give you some idea of the CFM range you are looking at with these fans. On average you are likely to find the clip on, mini fans have on average 2-3 speeds, you can find however variable speed mini fans which will give you a wider range of airflow options. Because a lot of the mini fans are made to be portable they are generally battery powered and many/most also have the option to be charged via USB. You won’t find a whole lot of features on these fans however there are a few models which have the odd useful feature. Some models of fan feature a charge light which enables you to see when the fan is fully charged. A great feature if you use your fan out and about and want to make use of the full charge. There are a few models of mini fan which can act as a charging station for other USB devices. Handy for travelers or the office desk with hard to reach computer USB slots. Although not a built-in feature for all fans, some fans do offer an external car charger available should you use your fan in that scenario. Various manufacturers produce mini USB fans with misting capabilities. Depending on the manufacturer, fans can mist for up to 25 mins and may have multiple misting modes. No more pesky buttons! Some models of fans offer touch control for turning your fan on & off and on some models fan speeds. As there is such a wide range of variations of what you would call a mini fan, prices will likely vary a bit between the styles of fan. Generally though, for a mini fan you could expect to pay from around $5 to $50 depending on the model and features. Floor fans are simple but powerful fans which are good for users who are looking for some serious airflow from their fan. With airflow / CFM similar to that of pedestal fans they have the added benefit of being slightly more portable, however, they do not have the features that pedestal fans have. When it comes to design floor fans very much follow the mantra ‘form follows function’. Generally, if you are purchasing a floor fan it will be with the purpose of moving air and not really to compliment your decor. In terms of different styling, you will not find many variations with floor fans. Mostly the design is much the same throughout the different brands. In terms of size you will find floor fans range (in diameter) from around 12” small floor fans to 30” industrial grade floor fans..
One handy thing about some models of floor fans is that they are designed with the ability to double up as a wall mount fan. If you need to be certain what CFM range a fan has, always check with the manufacturer or selling before you buy. Generally, though you will find floor fans to have a reasonable airflow ranging between about 3000 CFM to 6000 CFM for more industrial grade floor fans. Because of their basic nature, again you will not find a huge range of wind speed options with a floor fan. You can expect to see a range of 1-3 wind speed options with the majority of floor fans. Given most floor fans do not oscillate and that the placement of the fans is on the floor, you have more options than most other fans in terms of the direction of the fan. Most floor fans will have the ability to rotate the head often up to 360 degrees. Much like the oscillation feature, although there are some models that do offer a remote control feature, the vast majority of floor fans will not have that option. A feature common on tower fans and pedestal fans, sleep and breeze mode again is not common in floor fans but some models provide this feature. Floor fans vary in price range quite significantly given you can buy smaller floor fans from around $15 dollars and can pay up to $250 for more powerful, industrial grade floor fans. A misting fan generally comes in the form of one of the other fans discussed in this article such as a floor fan, pedestal fan or handheld fan but has the special misting feature which makes its purpose a little different from the other fans. The simplified version is it shoots out a mist of tiny droplets of water into the area around it. These tiny drops then evaporate in the warm air, however when they do it takes the heat of the air with it. 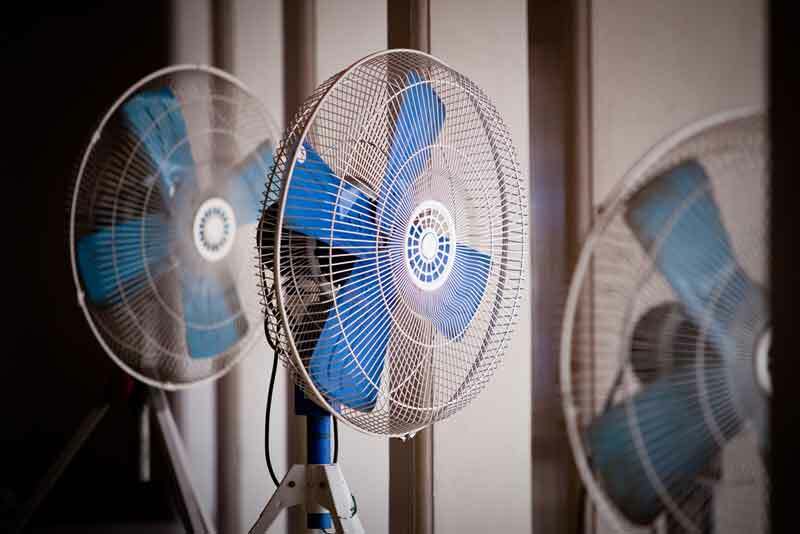 Check out our complete guide to misting fans. For a more advanced explanation check out this article. Misting fans come in a range of sizes and styles. Much like the standard handheld and person fans, the small misting fans have many colors, designs, and shapes available for personal use. For outdoor use there are a few options. A common design for an outdoor misting fan is very much like that of a pedestal fan. 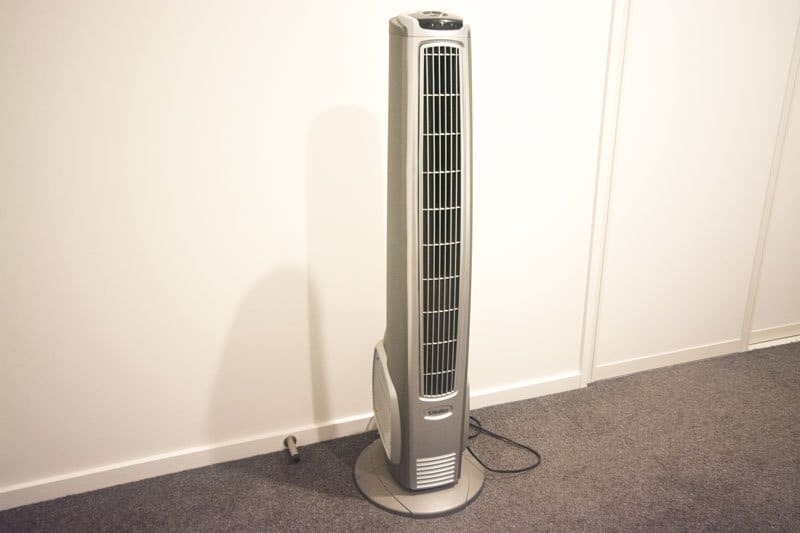 Like pedestal fans it has a few benefits in that it can oscillate, the height can be adjusted and the head can be tilted and rotated to direct the air and mist flow. Misting fans also come in the form of a blower fan in this case, which has a removable misting kit for easy cleaning. Bucket top misting fans are also common. These fans look much like floor fans in some cases and have dual options when it comes to fueling the mist with an attachment that can connect directly with your hose, or alternatively, a purpose-built bucket can be bought which can also connect directly to the misting fan. 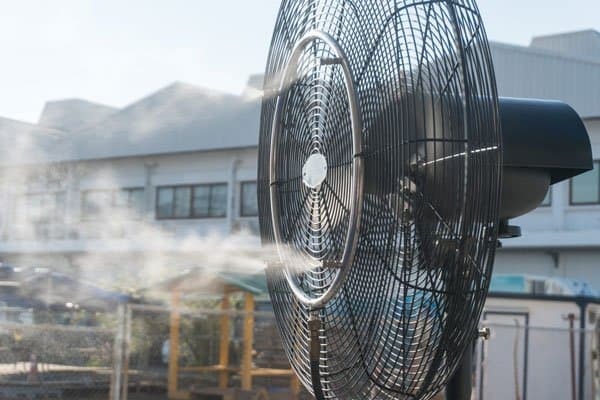 Often, if you are looking at larger, misting fans for commercial settings you will likely find fans that do sit on buckets, or water storage systems as they are more portable and do not need to be connected to a hose. Actually, there a couple of metrics you will want to be aware of when it comes to misting fans. Of course, like most fans, CFM can give you an idea of how powerful the airflow of a fan is. But one other thing to consider with misting fans is the PSI or ‘pounds per square inch’. A high pressure (PSI) and small nozzles combine to help make a small, thin mist layer which makes the misting process more effective. Similar to floor fans you can expect to find 3 speeds as the average for misting fans. Given the various kinds of misting fans it is a bit hard to give a good size comparison, however many have round fan heads, much like a floor fan and pedestal fan. Most of the personal, handheld misting fans can be bought for around $10-$20, however, the larger outdoor misting fans you should be able to find from $90-$250. The larger, commercial misting fans can be up to $2,000 or more. If you are looking for large, commercial alternatives to misting fans to keep you cool, you could cast your eye over a portable ‘evaporative cooler’. Bathrooms exhaust fans are essential in keeping your bathroom area in a healthy condition. Not having a bathroom fan can cause steam in your bathroom to create mold and mildew, which can have a negative impact on one’s health. Along with that, your paint can crack, wallpaper can peal and the wood in your bathroom can potentially rot. 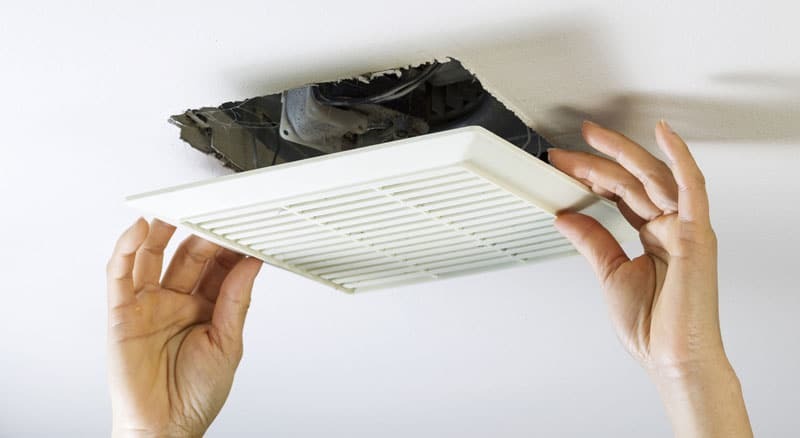 View our comprehensive guide to Bathroom Exhaust Fans here. Features you may find in bathroom fans could include Lighting, dimmer, humidity sensor, motion sensor, indicator light, heater, speed control, speakers/Bluetooth and/or automatic shutoff. Prices of bathroom exhaust fans will vary depending on the features you choose but typically will range from around $40 to $180 dollars. Pedestal fans are one of the most common choices of fans to help people cool their homes along with tower fans. 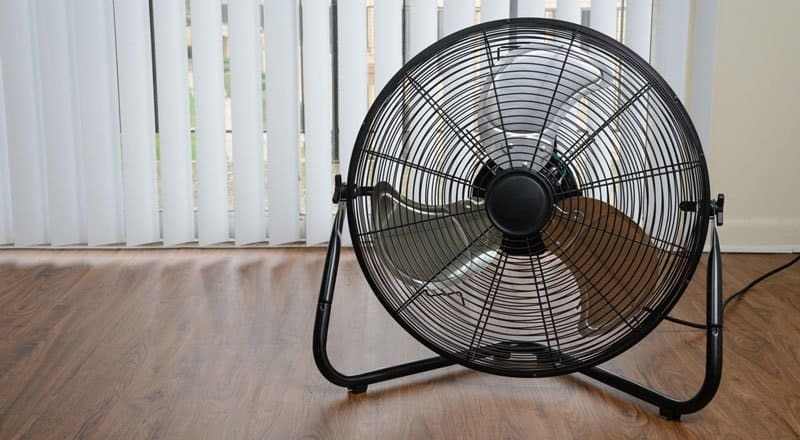 View our comprehensive guide to pedestal fans. Pedestal fans can vary a little in design. Types of pedestal fans can include rustic, vintage, modern styles along with various brand stylized design which can help with finding something which will fit better with your decor. 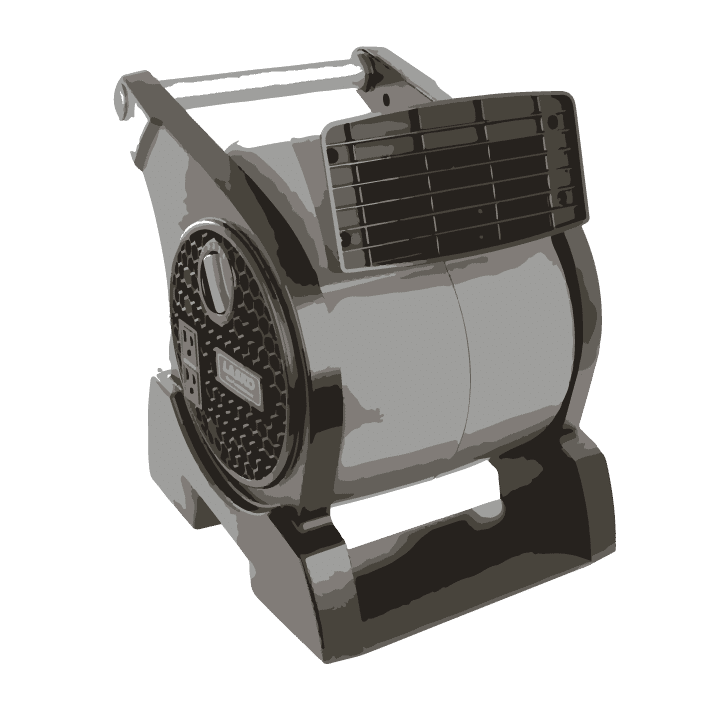 The airflow or CFM of a pedestal fan can vary from fan to fan and from standard to industrial. Some more industrial grade fans can have a CFM rating as high as 13,000CFM while your more standard pedestal fan might be more around 2500 CFM. Pedestal fans come in a large range of sizes and can reach up to 84” inches height adjustment with some models. Although generally not as feature packed as tower fans, pedestal fans do offer a larger array of features than floor fans. Pedestal fans can come with a number of the following features: Ultrasonic humidifier, variable speeds, oscillation, various fan modes, electronic displays, timer, and a remote control. When looking for a pedestal fan prices will vary from around $17 to $250 generally with a large range of fans available for under $100. Window fans are small fans that, funnily enough, sit inside your window framing. The benefit of these fans is that you are able to move air directly from inside or outside of your house, enabling you to push out stale and take in the fresh air. These types of fans are on average a little less powerful the box fans. Window fans are not really going to contribute anything to your home decor. For the most part, they are form follows function in terms of their design. You will, however, find a few variations when it comes to the form. Window fan models come sometimes come with 1, 2 or 3 fans for creating airflow. A lot of window fans do not disclose their CFM it is a little difficult to give a range of outputs, however, according to Homemadehints the Air King window fan has around 3560 CFM for the 20-inch version. You will generally find with window fans that you will have the option of 2 – 3 speeds. Finding the right size window fan to fit your particular window is crucial. Manufacturers have recognized this issue and many window fans have extender screens, which can help fill out some gap in window space in order for your fan to fit nicely in the window should the dimensions of your window be a little larger than the fan itself. A lot if not all of the 2 fan window fans will give you the options of controlling each fan independently so you can focus on pulling fresh air in, pushing stale air out or doing both at the same time. Having this option gives you greater flexibility when it comes to your current air quality needs. A number of window fans offer a thermostat to help your fan do its best to automatically control the temperature of your room. Set a temperature and your fan will try to regulate your room to that number. Much like the independent fan control on the double fans, most fans offer a reversible motor. This is particularly important with the single fans as this again, gives you the ability to both push stale air out and pull fresh air in. If you intend to use your window fan in any condition or you don’t want to have to remember your window fan is still in the window then it’s important to ensure you have a water rated window fan. This day and age if an appliance isn’t a smart appliance, it should at least have a remote control for convenience. Though not all window fans come equipped with a remote control, there are still a number of models that do. Digital window fan models can come with an LED display unit so you can easily see and change any settings on the fan. Again, window design and fit will be crucial for your choice of window fan. There are models of fans out there that accommodate both vertical and horizontal windows for extra convenience. Tower fans are one of the more popular fans of households and they probably have the most features and design options when it comes to fitting in with your decor. Though on average, not as powerful as pedestal fans, they will often have more features and will likely fit more discretely in your space. Check out our comprehensive guide to tower fans. Tower fans can vary quite a lot in design and are probably the top choice if you are looking for a range of fans that might fit nicely with your decor. Tower fans come in a large range of sizes and can reach up to 84” inches height adjustment with some models. For the most part, tower fans generally come with more features per fan than your average pedestal fan, with wind mode, remote control, speed settings, electronic displays being standard on most (not all) fans, while other fans may also have extra features. Tower fans can come with a number of the following features: Variable speeds, oscillation, various fan modes, electronic displays, lighting, Ionizers, thermostats, timer, and a remote control. Ceiling fans are a great addition to any home for a combination of reasons. A lot of people may not realise but ceiling fans can be used to control the temperature all year round. This can help reduce your power bill in winter. There are many styles and features that come with ceiling fans giving them more use than just helping heat and cool your home. Of all the fans listed in this article ceiling fans probably have the widest variety of design options and there are many different types of ceiling fans. You are able to go for a rustic look, vintage, modern all the way to themed ceiling fans such as baseball bats and propellers, there really is a style for almost everybody. It is pretty common for a ceiling fan to come with a light or lighting kit, or at least have it as an option. One thing to take note of is the type of bulb that the lighting is using. If you are power conscious, look for the fans that use LED bulbs in order to save that little bit extra on your power bill. Ceiling fans can often be controlled in a few different ways. One of those ways is with a remote control. With the remote control, you may be able to control the speed, lighting, heat, direction and/or fan functions which really makes things convenient. Another way ceiling fans are controlled are from a wall control. Placed near the door entrances/exits these controls are useful when you are on the move. The Energy Star Rating is great for those that are energy conscious and want to ensure they are using as little power as possible. There are a number of energy star rated ceiling fans which are proven to use a minimal amount of energy. Couple that with LED lights and you have a cost-effective unit. This feature is often overlooked but is a superb feature. Use the reverse switch to reverse the fan in winter and you have yourself a fan which will help distribute the heat in your room in winter, more effectively, saving you on heating bills. Using a pull chain to control a ceiling fan is a more traditional method of controlling the speeds of the fan. Some vintage and retro fans will have this feature to keep with the character of the fan. Smart products are the way of the future and some ceiling fans have now jumped on board the wifi train. With wifi fans you are able to control the functions of your fan on your phone or by voice control with Amazon Alexa. There are ceiling fans out there now which come equipped with a heater enabling your fan to create the heat and distribute that heat through your house from the one location. Most ceiling fans will come with 3 various speeds or they will have variable speed control. Ceiling fans have a large range of sizes ranging from 24 inches to a whopping 288 inches for industrial sized ceiling fans. Not just because there is a huge variation in sizes but many other factors contribute to how much CFM a ceiling fan has. Blade pitch, blade shape, the number of blades amongst other things are some factors that can contribute to CFM ratings. Even fans that are similar sizes will vary in CFM output depending on their design. That said, you may find CFM values between around 2000 CFM to well over 50,000 CFM for industrial sized ceiling fans. Given all the variations in regards to ceiling fans the price range also varies dramatically. Some ceiling fans can be purchased for as little as around $40 while the larger industrial grade ceiling fans can be in the vicinity of $6,000 and upwards. 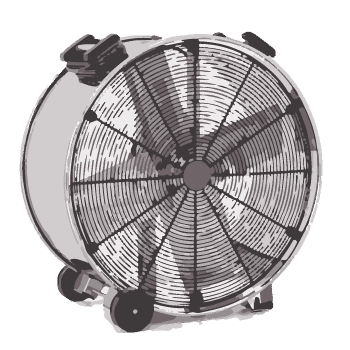 A drum fan in some ways could be described as a floor fan on steroids. They generally tend to be a bit bigger and more powerful but overall are quite similar to floor fans. Because of their extra size they also tend to come with wheels for easier movement and transportation. Much like floor fans you won’t get a lot of design variation apart from some color options and minimal design differences. Given their application is more suited to industrial spaces, or spaces such as garages, their aesthetics are not as refined as a fan that may go in your home. The design and materials are also generally made for rugged conditions, with rust free sturdy metals used to ensure longer lasting shelf life. When it comes to drum fans and features, what you see is really what you get. Features are minimal, drum fans are created for one purpose and that is what the design is focused on. Some (but certainly not all) drum fans provide a tilting feature which allows you to better control the direction the airflow is flowing. Some models of drum fan have the design and ability to be able to be mounted on a wall. Drum fans tend to come with 2-3 speed settings. The size of drum fans typically vary from around 24” to 48”. What Airflow do Drum Fans Have? As mentioned above, typically a drum fan is going to have more CFM than a floor fan and you can expect to find around 4000-22000 CFM in a drum fan depending on the size. What is the Price of a Drum Fan? Prices of drum fans vary from around $40 for smaller less powerful fans up to $600+ dollars for larger more powerful industrial strength fans. Blower fans are small industrial-looking fans that are often used for drying carpets, ventilation and providing cool air for people in various locations. For their size their output is good and they are highly portable and perhaps more durable than other fans of similar size. Because of its portability and small size blower fans are not really designed for aesthetics. Given they are often used in more rugged spaces such as garages, workshops and the likes, their design is somewhat reflected in that. Though there are not a lot of features, one useful feature that is often incorporated into a lot of blower models in the ability to use the unit as a power outlet. Some blower models have up to 2 outlets, which can be useful in garages and workshops and when you need to plug something else in near to where your fan is located. For their size, blow fans have quite reasonable output. Output can range from around 200 CFM to 600 CFM on the higher settings. Generally, you will find blower fans to have 3 speeds. They look deceiving in their size but blower fans are small and highly portable units. Most blower fans of this kind will come between 15”x 12” x 15” and 8” x 5” x 8” or near abouts. For the most part you will find blower fans priced around $60-$80. Probably not what you would call a fan as such but an evaporator cooler has much the same job as a regular fan. Often called swamp coolers, these units go about cooling in a different method to your regular fan and is more effective in hot, dry climates with lower humidity such as the mid-west/west coast (USA) and should not be confused with an air conditioner. These units are not suitable for everyone and this article can help you decide whether an evaporator cooler is right for you. There is a bit more variation in design when it comes to evaporator coolers compared to a floor fan or box fan. Shapes, sizes, colors, and styles can all vary a bit from model and make which gives you a better choice should you want the unit to somewhat match your decor. Evaporator coolers make use of an air filter which gives you cleaner, fresh air. When it comes to airflow, portable evaporator coolers come in the range of around 176CFM – 4500CFM. However, industrial sized evaporator coolers can be massive reaching 22,000CFM and over. Generally portable evaporator coolers have 3-4 speeds. 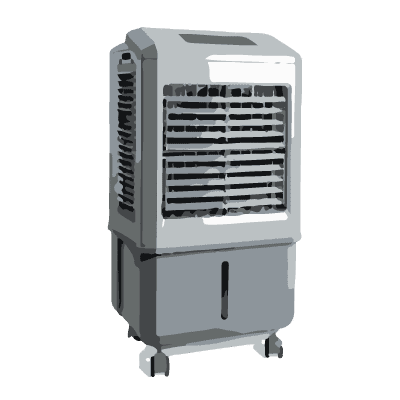 Below is a list of features you may find in portable household evaporative coolers. To give you an idea of sizes many household evaporative coolers will likely come in a size between the following. There is a large range of prices for evaporative coolers. Depending on the features and power of the cooler you are after you will likely expect to pay between $60 and $600 for an evaporative cooler with large industrial sized coolers costing up to $5,000.